Mr. Frank Manship, son of Postmaster Manship, has purchased from his employer, Mr. Paul Will, the meat market at No. 45 South Street, Philadelphia. Frank has been employed in this business for the past ﬁve years, and must be acquainted with it. He is a bright boy and will undoubtedly make his mark in the business world. We call him “boy” but he is of that class who-stormed Sebastopol. Last week the plaster was torn from the ceiling of the colored schoolhouse, and the room ceiled[iii] with lumber. School opened on Monday under the supervision of Miss Arielle C. Neal, of Hampton, Va. Since the late frosts people have been busy digging their sweet potatoes and getting the fodder from their corn. Some of the corn has been stripped very green and the yield will be injured thereby. Mrs. Louisa Burrel, the new proprietress of the Hart House, has cleared away the old fence from around the building, and cut a door direct through into the reading-room. By this improvement the reading-room can be better heated. Mr. James Collins was taken to the Pennsylvania Hospital last week to undergo an operation. Mr. Collins is a pensioner of the Civil War, and has suffered much of late with his disease. On Friday Mr. Harry Robinson shipped a load of corn and feed to Cape May, via schooner Rio Grande. The platform of the Queen Anne’s Railroad at Milton Station, is becoming dangerous, and unless it is repaired soon someone may get a broken leg. Rev. Dr. Lewis of Westminster, Md., ﬁlled the pulpit at the M. P. Church on Sunday evening. A regulator has been put into the principal’s room of our Public Schools by J. B. Welch, the horologist. There will be a “Sunday School Rally Day Service” held at the M. E. Church on next Sunday afternoon at 2 o’clock. There will be a special program prepared for the occasion, and the parents of children are especially invited to be present. Protracted services, under the management of the Rev. L. P. Corkran, commenced at Zion M. E. Church on Sunday evening, and will continue for two weeks and perhaps longer. John B. Gere died at the residence of his sister in Lincoln, on Saturday of consumption, aged about forty years. The funeral services were held at the house of his sister on Monday afternoon by the Rev. J. E. Hills, and sepulture made in Lincoln Cemetery, S. J. Wilson embalmer and director. Katie N. Collins died on Saturday at the home of her sister, in Lewes, of consumption, aged 27 years, 3 months and 6 days. Funeral obsequies were solemnized at the house on Tuesday morning, and interment made at New Market Cemetery, near Ellendale. S. J. Wilson undertaker. We have heard of a certain young lady in town, that can do but little when she comes home from the factory, but stand before the glass and admire herself. She is pretty. Her mother has bought her a chair of convenient height that she may sit and admire herself, and it is said the mother got “up the other morning and found her daughter before the glass” at 3 30 a. m.
Two little girls on Chestnut Street have been caricaturing their older sisters. They are about eight years old and dress themselves in long dresses, with a becoming train, and with the train in their hands they make merry for the onlookers. I live very near Mr. Starkey, the druggist, and I was much amused a few mornings since to see Mr. Starkey out in the garden going down on his ground like “Pat Maloy” was “going down on the boulders.” But Mr. Starkey was all right and is industrious. I suppose he got out on this particular morning thinking I would not see him. But he was doing the job nicely. Every once and a while he would raise up, put his hand where his stomach ought to be and mop his heated brow. Mr. Starkey is industrious. Miss Laura Bellows, of Beaufort, S. C., was married to Mr. Henry Baeth, of Atlanta, Ga. Miss Bellows is a. daughter of Mrs. Martha Bellows[iv] and granddaughter of Capt. Joseph C. Atkins, of our town, and sister of ex-State Treasurer C. H. Atkins. They are to visit their grandfather’s family on their way to Atlanta, and will reside in Beaufort, S. C.
Schooner Golden Rule, Captain Pettyjohn, is unloading a cargo of coal for lsaac W. Nallor. Contractor I. W. Nailor is excavating and laying the foundation for the bank of the Sussex Trust, Title and Safe Deposit Company in this town. The Wagaman Brothers are tearing away the old Paynter Mill, with the purpose of making a better one. It is understood that Mr. Abbott, of Milford, will do the job. We know Mr. Abbott, and we know he will do a good job on the Wagaman Mills, but he must have workmen of the right stamp. Conwell & Co. paid 27 tents for tomatoes today (Tuesday). The season is late, but they shipped over 500 baskets. Mrs. L. P. Corkran, the accomplished wife of our esteemed minister, is this week, visiting friends at Ellendale, Lincoln, Milford and other points. The ladies of the M. P. Church of Milton, will on the 25th and 26th of this month, hold a “conundrum supper.” The menu will be served in up-to-date style. There will also been bargain counter, and for the amusement of all an art gallery. Five cents admission will be charged to see the wonderful works of art. Proceeds for beneﬁt of the-M. P. Church. [ii] David A. Conner quotes from a short article by George D. Prentice in which the latter makes reference to a play by the British dramatist Serjeant Talfourd, “Ion,” a Victorian expansion of a Greek myth. Prentice’s article is a meditation on the inevitability of death and mankind’s fear of it, but uses the words of the doomed Ion to his lover Clemanthe – “We shall meet again..” – to suggest the hope of an afterlife in which we encounter all those who whom we hold dear and who have passed on before us. [iv] Mrs. William C. Bellows is the married name of Martha Emma Atkins, (1845 – ? 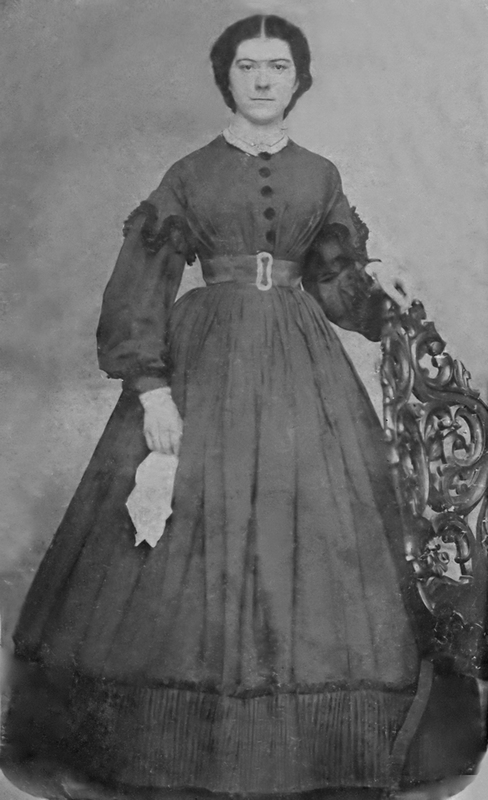 ), wife of William Chauncey Bellows, whom she married in 1872. Given the use of her maiden name on the handwritten label in the album from which this was obtained, the portrait probably precedes 1872. She was the daughter of Joseph Copes Atkins and his first wife, Mary Ann Waples of Milton. One of Martha’s first cousins was George W. Atkins, the father of Mary E. M. Atkins, memorialized on one of the Lydia B. Cannon Museum stained glass windows. Another cousin was Margaret Coulter Carey Atkins, who eloped with Capt. 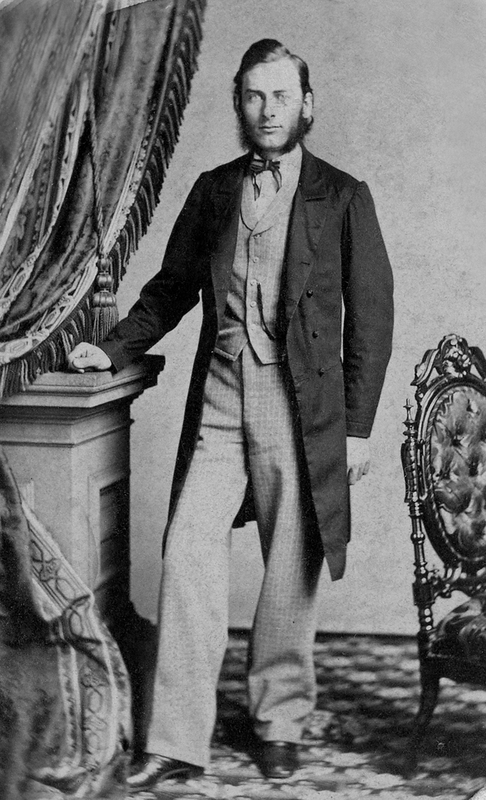 John Fisher in 1890. William Chauncey Bellows (1837 – 1903), a machinist, was born in New York and ultimately established himself in Beaufort County, SC. The connection to Milton is through his marriage to Martha Emma Atkins on November 16, 1872. William and Martha had four children in total, one of whom was the Laura Bellows mentioned in this Milton letter.